Welcome to Studio Katia Fall 2018 Release Blog Hop! I want to share with you a cutie-spooky card and video process of how I made it. Please, enjoy the video, click HERE! BLOG HOP GIVEAWAY info: Studio Katia is giving away TWO $50 CAD gift certificates on each day of the Hop, winners will be chosen from the comments left on all blogs of the Hop! What a CUTE way to do the webs! I love the bright colors! Stunning colour work, Love the bright happy colours you've used. What a wonderful halloween card! I love the way you used the different colored die pieces for the web! Reminds me of a kaleidoscope! Absolute stunning what you did with the spiderwebs, so awesome card. Thank you so much Galina voor sharing and for the video tutorial. Wonderful card. I really love those monsters and your background is gorgeous. Love the spider webs - so vibrant and pretty. Thanks for sharing this cute card. Wow! I love how vibrant the colours are on your card. Clever idea to make a stained glass window. I love the bright colors and how you used the spider web die! Deep, vibrant colors.... wonderful. Such a fun card. WOW what a really cool looking card! I just love the different colors for the different sections of the spiderweb! Very pretty! And those googly eyes are just so precious! You are a magician of colours .So talented!! Love the bright colours! SO darn cute! What a fun card! Love the way you used the spider web dies! Great colors! I just don’t like monsters I can’t help it but I do love the colors you used they really pop !! What a great work! Stunning card and thank you for the video tutorial. What lovely friends in this card!! Wow what a great card! It’s so colorful and fun! I love the web! I absolutely love your card! The inlaid spider webs are beautiful - I would have never thought of doing that! And those monsters are so cute - they always make me smile! Thanks for the inspiration! What a fun Halloween card I love the colors and the design of this card. GASP! I'm blown away by your inlaid spider webs! Talk about a 'spook-tacular' impact...the perfect background for your oh-so-scary (not *grin*) monsters! LOVE this! stunning work - so BRIGHT!!! Such a fun, bright card! Beautiful colors on this card! Great job! Such a fun and cute Halloween card. What a fun Halloween card! I love the spider webs in the background. Such a fun Halloween card, love the colours. YES, those monsters are TOO CUTE! I love the spider web inlays. 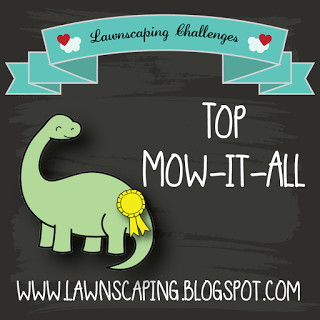 What a terrific idea, along with the adding the googly eyes! Thank you! 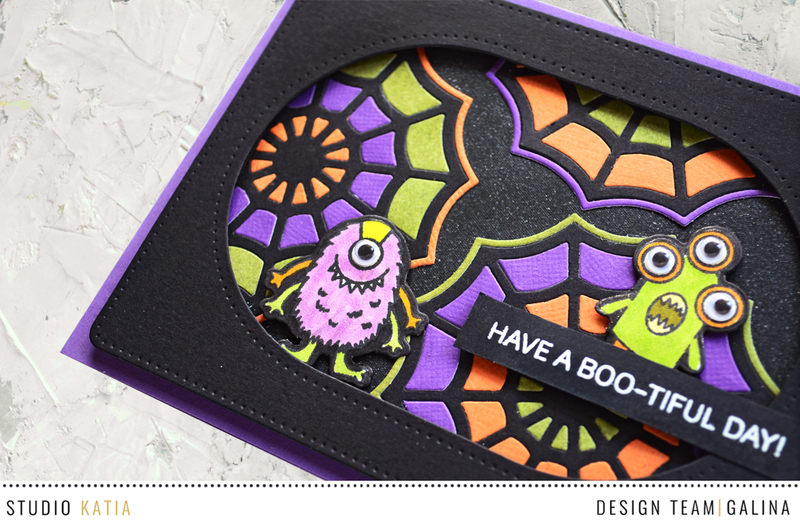 What a great idea to put the various traditional Halloween colors in the spider web background! THat is amazing and such a great idea! It grabs your attention but does not overpower the card!!!! I really love the green monster with the three eyes! A fantastic card! 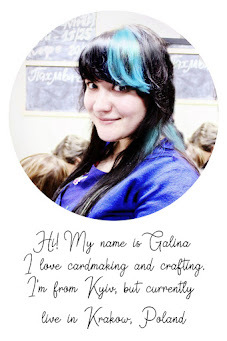 Fantastic card Galina! Love the vibrant colors. Super creative design. This is really great! I love the colours and the inlay background! Dear Galina, I've some issues with your IG page. I'm your follower but for a while now I'm not able to see your page. Can you help me? On IG, I'm raggiodiluc3. I was entering Heffy Doodle and Honey Bee Stamps' Blog Hop and I wasn' able to comment on your post so I understood that something was wrong. Thanks in advance. How fun--love the vibrant colors. This card turned out so cute! The Monsters are adorable and looks great with all those Halloween colors. So cute with all the die cut webs in multi colour! The die cut inlay is so cool! I love how you used Halloween-y colors to help highlight the web design. Then with the monsters on top? My favorite kind of "spooky" card: adorable! Thanks for sharing with us. I love the inlay on those spider webs, what a cool and graphic background! Absolutely fabulous!!! I love all of the bright, fun Halloween colors you used.